Today is Earth Day, and along with millions of people around the world, I am praying for our blue-green planet, our common home. As part of Amherst Cinema’s “Science on Screen” film series, I recently gave a short talk before the screening of Leonardo DiCaprio’s film, Before The Flood. I and the other guest speaker, Professor Scott Jackson of Kestrel Land Trust, were asked to speak briefly about the roles that land conservation, faith communities, and individual action can play in fighting climate change. Below is the text on which I based my remarks. I am grateful to have a few minutes to speak about the spiritual and moral call to heal and protect the Earth, and about the approach that communities of faith are taking as they become aware of the climate crisis. I use the word “crisis” very deliberately, because despite the current unwillingness at top levels of government to admit the accuracy or relevance of climate science, the facts are clear and beyond reasonable dispute. Climate change is real. In just a century or two, a blink in geologic time, human beings have extracted and burned so much coal, gas, and oil and released so much carbon and other emissions into the air that we’ve altered the chemistry of the global atmosphere. With an average rise in global temperature of just one degree, and with more warming on the way, we are already seeing a cascade of effects, including rising seas, melting glaciers, acidifying oceans, massive droughts and floods, and dying coral. Scientists are usually known for staying calmly detached and objective, but they are now using words in public like “shocking” and “alarming,” and they are beginning to speak openly about their fear and grief. The movie we’re about to watch together, BEFORE THE FLOOD, reminds me of the ancient story of Noah, the mythic figure in the Bible who was divinely inspired to understand that a wave of cataclysmic change was coming upon the Earth and that he was called to respond boldly – to do everything in his power to be of service and to save the life around him. 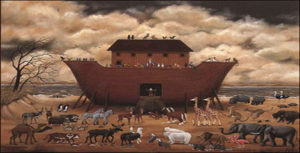 You know the story: he built an ark, he invited in the animals, two by two, and he saved life on Earth from the flood. The story of Noah is the story of every person who takes a keen look at the world, listens inwardly to the wisdom of his or her deepest spirit, and responds by taking action on behalf of others. In a time of climate crisis, I want to give you two words that characterize people of faith, people like Noah: reverence and resistance. Why reverence? Because we hope to cultivate in ourselves and in each other a deep respect for Earth and all its inhabitants, human and other-than-human. Because we want to remember that the land is holy, the water is holy, the air is holy, and life itself is a precious gift. Because we recognize that society too often treats people – especially poor people and people of color – and the whole natural world as if they were objects to dominate and exploit, instead of beings with intrinsic dignity and worth. Because we live in a society that too often pretends that human beings are separate from the web of life, not accountable to a law higher than the supposed laws of economics, and without a purpose greater than grabbing for riches, status, and power. Reverence takes many forms. We are reverent when we walk the Earth mindfully, blessing it with every step. We are reverent when we pay attention to the beauty, mystery, and suffering in the world around us. We are reverent when we reduce our carbon footprint, walk and bike more often, or ditch the dryer and hang our laundry on a line. We are reverent when we try to encounter each person, each creature, each moment, with sincere interest and an open heart. We are reverent when we refrain from speaking harshly or with contempt, for reverence teaches us compassion. Reverence is a stance of the spirit and a conscious practice: we intend to honor each other and the Earth. We intend to treat each other and the world around us with kindness and respect. Why resistance? Because people of faith have a long history of rising up against injustice and speaking out against policies and practices that oppress, abuse, or cause harm. Because when we put our faith into action and stand in direct opposition to an unjust status quo, we follow in the footsteps of prophets and leaders of every religious tradition. Because we refuse to stand idly by while political powers ramp up their efforts to devastate the Earth. Because we live in a climate emergency: unless we rapidly reduce consumption of fossil fuels and make a swift, bold transition to clean, renewable sources of energy like sun and wind, we will leave a ruined and possibly uninhabitable world to our children and their children. Resistance takes many forms. We resist climate catastrophe when we risk arrest and take non-violent action to stop new pipelines; when we lobby for a fair and rising tax on carbon; when we urge colleges and other non-profits to divest from fossil fuels. We resist climate catastrophe when we support our local land trusts and farms, plant trees and community gardens, and reuse, recycle, share what we have, and buy less stuff. 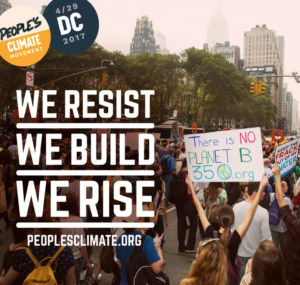 We resist climate catastrophe when we march and join rallies, engage in public fasts and prayer vigils, contact politicians, vote, and even run for office ourselves – all for the sake of directing society away from the edge of the cliff of continuing business as usual and toward a more sustainable path. Resistance is a stance of the spirit and a conscious practice: we intend to protect each other and the Earth. We intend to stand up for life over death, for love over hate. 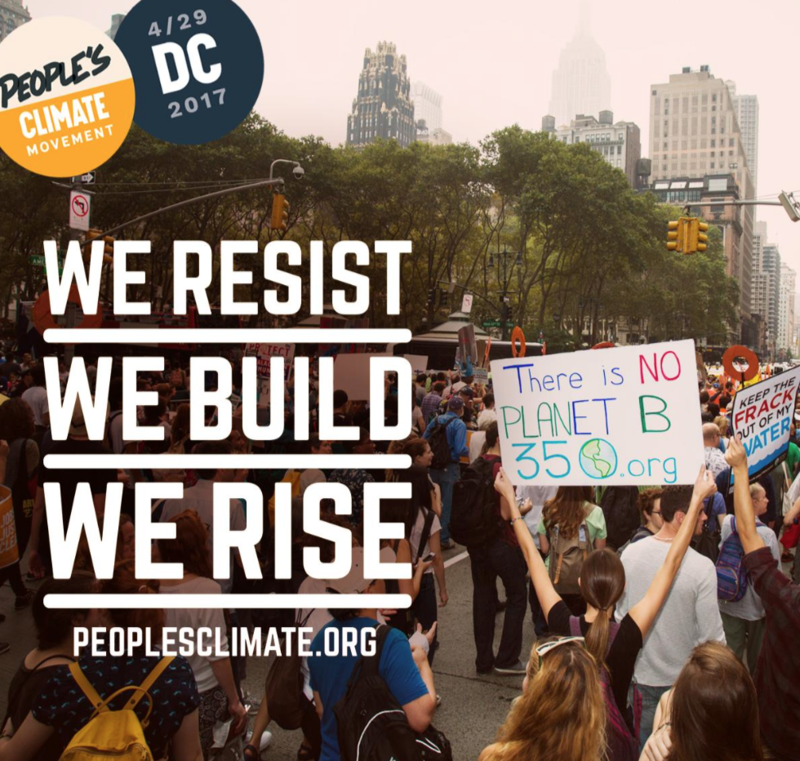 One is to join the climate march in Washington, DC, that will be held next Saturday, April 29. Sister marches will be held in cities across the country, including Springfield, Greenfield, and Boston. I will be heading to DC, and I’d love to see you there. Second, we can join a wonderful, local, grassroots, climate action group, right here in the Pioneer Valley: Climate Action Now. We live in precarious times. The word “precarious” derives from the word for “prayer.” For people of faith, this is a time for prayer, a time to seek God’s presence and guidance. To circle back to the story of Noah: after the flood, God makes a covenant for all time with every living creature, and puts a rainbow in the sky as a sign of God’s unfailing love for all creation. When we act and advocate to protect God’s Creation – when we hold in our hearts the future generations who count on us to leave them a habitable world – I believe that we do so in the presence and power of a divine love that will never let us go.